We are experiencing a particularly snowy winter here in New York. It starts out fun enough, until you're knee deep in mysteriously colored snow slush. I tend to like my nail art to feel relevant to my life, so rather than painting the beach landscape I'm yearning for, I opted for a slightly romanticized snow manicure. No slush or shoveling, just shimmer and snowflakes. 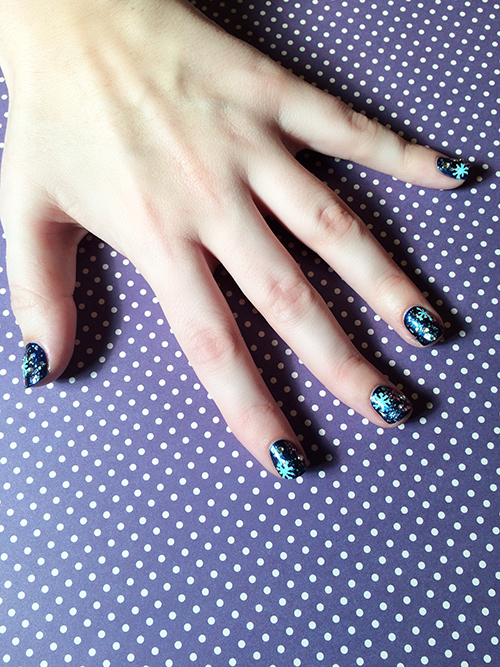 To start this design I painted my nails with OPI Yoga-ta Get This Blue, before adding a coat of Ciaté Celestial. This chunky silver holographic glitter is perfect for adding a bit of whimsy to your snowy nails. Then I took a light blue acrylic paint pen (never rule out the arts and crafts store as a mecca for nail art supplies) and carefully added a snowflake to each of my nails. 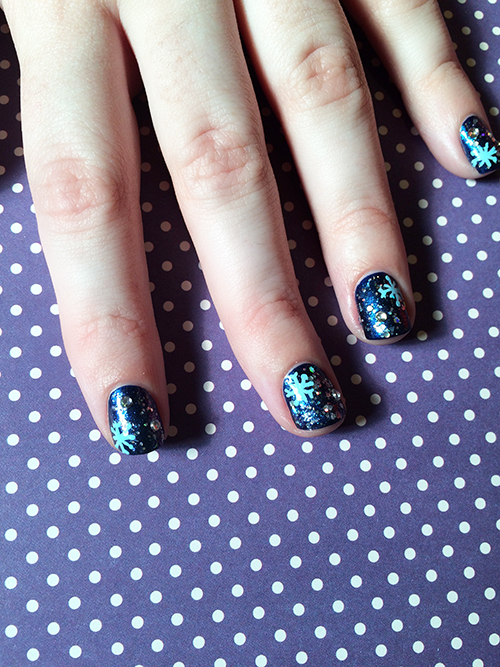 Snowflakes are an ideal design for a nail art novice because there's no pressure to make each one look the same! As an (optional) finishing touch I added a few iridescent rhinestones and a thick layer of topcoat to hold everything in place. Now when I'm shivering during a trek through the snow I can look down at my sparkly nails and forget for a few moments about the reality of the city’s gray, not-so-pretty slush.